You are here: Home » General » Over 50 Delight in the Season’s First Lyrical Luncheon! Over 50 Delight in the Season’s First Lyrical Luncheon! The Lauderdale Yacht club was the venue for the first Lyrical Luncheon of the season held on Thursday, November 19th. Event chairperson, Barbara Parent, greeted fifty society members and friends. She called on society president, Claire Crawford, who discussed upcoming events and introduced new members PJ Carswell and Sandra and Vincent Patalano. Barbara then introduced guest speaker Justin Moss, Director of Broward Operations and Outreach for Florida Grand Opera. Justin, with help from the Florida Grand Opera Young Artists, presented an entertaining program entitled “Closing the Gap: Opera Inspired Musical Theater.” Justin gave examples of some musicals that have their roots in opera. The Young Artists sang selections from Porgy and Bess, Guys and Dolls, Carousel, and West Side Story. 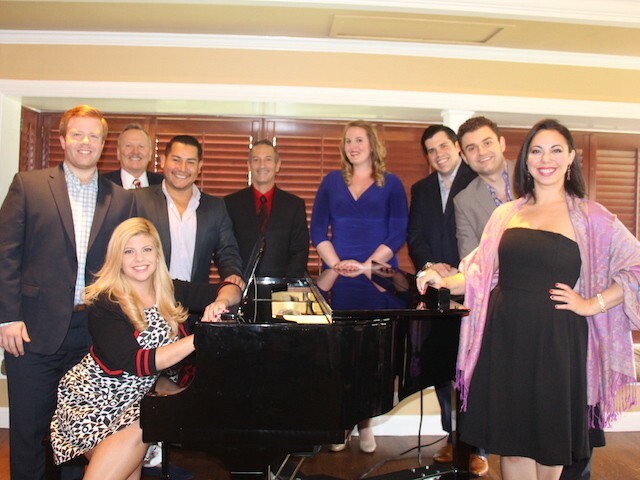 Performing Young Artists were Eliza Bonet, mezzo-soprano; Laura Martinez Leon, soprano; Sara Payne, soprano; Mario Arevalo, tenor; Alex Soare, bass-baritone; Nicolas Ward, baritone with Sergio Puig, pianist. The next Lyrical Luncheon will be held at 11:30 A.M. on Wednesday, January 27, 2016, at the Coral Ridge Yacht Club chaired by Linda Balent. Thank you to Betty Young for the wonderful photographs.